Reduction firings can bring out some wonderful colors in pottery. Many high-fire glazes are formulated for reduction, and will not work successfully in neutral or oxidation firings. These brilliant colorings and effects are created when metallic oxides in glazes change form. 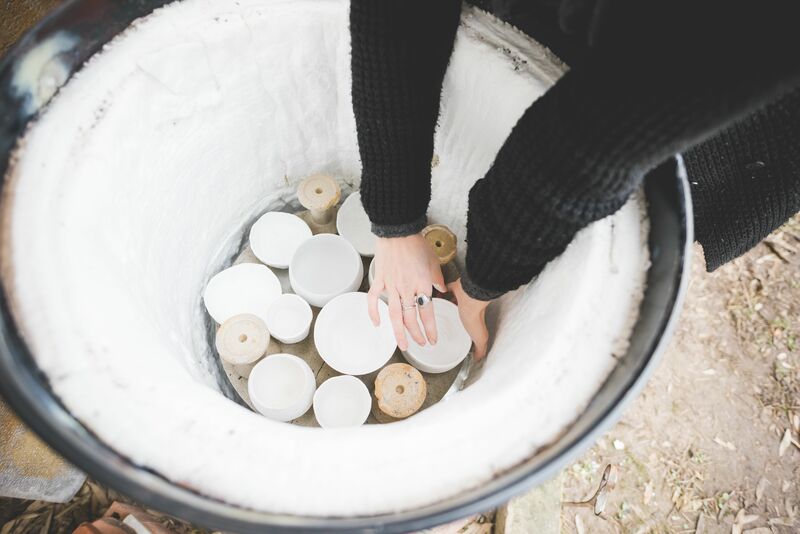 Each fuel-fired kiln will fire a bit differently, so expect to work with yours over a period of time before you find what works best with it. Even so, the basics are the same. Don't be confused by other reduction techniques that many potters use. Out-of-kiln reduction techniques such as western-style raku, pit firing, and barrel firing are different from in-kiln reduction firing. This article is only talking about in-kiln reduction. What Creates a Reducing Atmosphere? The trick is to reduce the amount of oxygen entering the kiln while the burners are still lit. Pumping in gas or oil without combustion at the nozzle can be very dangerous. Reduction cycles are generally done from a half hour to an hour and a half during the very last stages of the firing, before shutting the kiln down to cool. Do check your cone packs at least every fifteen minutes. Reduction causes most ceramic materials (such as your glazes) to melt faster. If you want more time in reduction without more heat work, reduce the amount of fuel (you may also need to reduce air-intake and close the exit flue or damper even more) so that the kiln is soaking, rather than gaining heat. Generally, start the reduction cycle when the witness cone before your target cone begins to tip. For example, with a cone pack with cones four, five, and six (the target cone being cone five), you will want to start reduction when cone 4 starts to tip. You want to build up some pressure in the kiln. Partially close dampers in the chimney or reduce the opening in the exit hole (depending on your kiln's design). Reduce the amount of air being drawn into the kiln―either slow blowers down, decrease the air opening in a venturi burner, or stuff a bit of ceramic fiber or fiber blanket into the port opening. How Do You Know It Is in Reduction? You can tell your kiln is in reduction when any openings (such as updraft exit flues or open peepholes) have yellow to orange flames coming out. Green or blue flames (or no flames, after waiting for the pressure to pop them out) means the kiln is not in reduction yet. The further the flame reaches outward, the stronger the reduction is. When using venturi burners, with experience you may also be able to tell the strength of the reduction by the whistle of the air going through the burner. CAUTION: It can take up to five minutes for the flames to pop out of peepholes when they are first opened. Do not stand directly in front of peepholes, and Do not place your face near the peephole to see the interior until the flame has popped out. Once the kiln has reached temperature and had the amount of reduction time as desired, shut down the burners and any blowers. Close the dampers or cover the exit flue completely. Put plugs in any open peepholes, and if the kiln is small, close off the burner port holes with either ceramic fiber blanket or small pieces of firebrick. The kiln does not have to be air-tight, but it should be shut off from most air-flow. (If the damper/flue is completely closed and all peepholes into the stack area are plugged, the pressure in the kiln will keep air from entering the portholes, as long as the kiln is large enough and the burner ports are not too large. Leave the kiln closed until it is cool enough to unload.